We’re proud to bring you our latest advancement in estimating and takeoff, with Cubit 9. Enhancing usability, speed, and efficiency is always at the fore of our efforts at Buildsoft, so we can deliver on our commitment to making construction easier. Working with the important feedback we get from our customers, coupled with our drive for innovative technologies, we’re excited to bring developments that continually improve the way you work. We know estimating can be time consuming. There’s a lot of competition to your business and everyone’s wanting to find a faster way. Estimating with Cubit is already fast, up to 10 times faster than traditional methods, and 3 times than that of other systems. Now we’ve changed the game. Now you can perform your takeoff in a fraction of the time, meaning you can produce estimates faster and more efficiently. Takeoff rooms and areas with as little as one click. With Auto Select, as your mouse moves over your plan, Cubit instinctively knows where your rooms and areas are, showing you a preview of your takeoff. All you need to do is click the area, and you’re done. It’s that easy. Even complex areas are faster and easier. Simply click one, or multiple areas, to build up your shape. 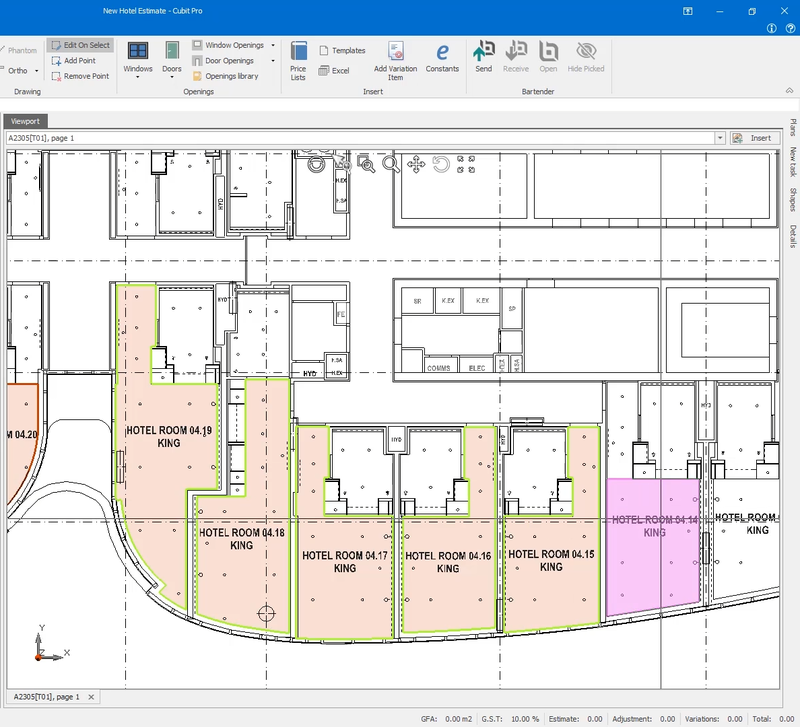 Unlike other systems, which rely on doctored plans, Cubit’s Auto Select will intuitively find the area you want, so you can rapidly takeoff from your plan whether it’s PDF or DWG. Previewing a shape to takeoff using Cubit's new Auto Select Tool. Performing your takeoff like this in a fraction of the time means you can take your efficiency and productivity to the next level. If the system doesn’t return the shapes you want for your takeoff, don’t worry. We’ve added new shortcut keys so you can switch between Auto Select and Cubit’s other powerful takeoff tools, and tailor the way you work to your plan. Faster takeoff means faster estimating, so you can get on with the business of building, and focus on the things that matter. There’s never been a better time for you to experience the speed, accuracy, and power of Natural Estimating with Cubit. At Buildsoft we’re committed to delivering you the tools you need need to perform your best work, which is why we’re always listening to customer feedback. Accurate quantity takeoff is the linchpin of successful estimating, and clear plans are essential to achieving that accuracy. We heard your feedback about the need for a better solution in Cubit; and we’ve listened. Building on the improvements released in major and minor updates of Cubit 8, Cubit 9 introduces significant improvements to the way your PDFs are displayed. Your plans are now represented more accurately than ever before, so you can clearly see and interpret your plan, and work with greater precision. Responding to industry feedback on how you work with referencing within Cubit, we’ve made improvements to make it easier to use; by letting you paste with relative references, paste only the values and copy the Ref Code from the formula bar with one click. For example, in your Calculation Sheet you may enter the height and width of a window, and reference those values to calculate the window frame, sills, glass and other items within the sheet. Using relative referencing, you can copy the entire Calculation to another Item, update the height and width, and the Calculation will update with quantities for the new Item only. It’s easier to set up templates and reuse rates and quantities throughout your Job. Relative referencing also works on the Item sheet and in Price Lists, giving you the flexibility to use values the way you want. For our customers who work with files from Global Estimating, we’ve added the ability to directly import a Job from Global into Cubit. Now you no longer have to transfer a Job between the two open programs, or have access to Global to read an E0X file; making it more practical to work with the files you need. Improve the way you estimate. Book a demonstration, and start your free 14 day trial today, and get ready to experience the power and speed of Cubit 9. For a full list of new features and enhancements in Cubit 9, you can download our release notes below. If you're a customer with current Software Assurance cover, you will be receiving your update via email within the next week, if you haven't already received it. To ensure we can meet the needs of our customers, these updates are sent in batches. If you haven't already received your update and would like to update sooner, please contact us. If you would like to update your software but do not have current Software Assurance cover, contact our Customer Success team on (02) 4626 4909.